The ATmega128 CPU BOARD is a simple adapting board which changes a TQFP(Thin Quad Flat Package) to a DIP(Dual Inline Package, 0.1 inch pitch) type. The ATmega128 CPU is an ATMEL 8 bit microcontroller. 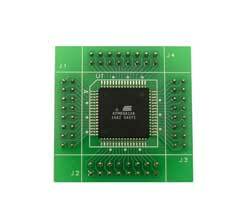 It is a member of the powerful ATMEL AVR CPU series.